Slow-worms are legless lizards and can grow to around 30cm in total length. Unlike snakes they have a distinct shiny lustre, cylindrical structure and moveable eyelids. They are brown, coppery or grey in colour and females have dark brown sides and usually a central stripe on the back. Young of both sexes are patterned like adult females. When born live in September the young are 7cm long and are light silver or gold with black flanks and underside and a fine black dorsal line. 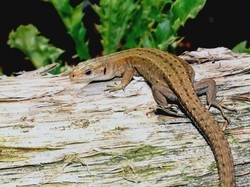 The common lizard is very variable in colour, but generally has a brown or greenish background, with a pattern of darker spots, flecks and stripes. Males have an orange belly flecked with black spots, while the females mostly have a plain yellowish belly. Adults can grow to around 12cm in total length. Young are around 4cm at birth and are entirely black or dark brown. 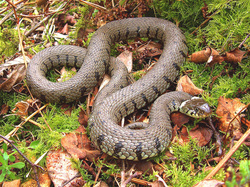 The largest british snake, grass snakes generally reach around 80cm in total length, although larger individuals occur. The adults and young are usually olive green, although varying between vivid green to dark brown. There is almost always a distinct yellow and balck collar, and vertical bars on the flanks. The belly has a black and white checkerboard effect. Eggs are white, parchement type shells, 2cm long, laid in compost or other heaps of rotting vegetation. Young are around 17cm at birth and have a dark background colour that highlights the light collar. 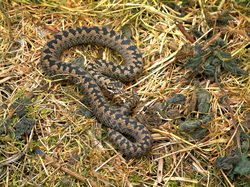 The adder is usually around 60cm in total length and has a general appearance of being a short fat snake. The adults and young are distinctively marked with a bold zig-zag pattern running down the back and dark blotches on the flanks. The background colour in the males is usually grey with the pattern black. The females and young usually have dark brown patterns on a lighter brown background. Young are around 15cm at birth. The adder is the only venemous snake in the UK, which has caused it to be widely persecuted. HOwever the risk of being bittern is very low indeed and the risk to life is almost negligable. There have only been 12 deaths since 1900 with the latest being in 1975 due to anphylactic shock, which is the same thing that affects people with nut allergies. Because of their fear of people, adders are very rarely encountered, and the greatest risk is in the early Spring when they have just emerged from hibernation and are very lethargic. The majority of bites happen when people attempt to pick them up at this time of year. Male sand lizards have vivid green flanks, with a patterened brown back. Females are brown and have black spots with white centres. Adults can grow to around 22cm in total length, with a bluint head and relatively large eyes. Eggs, which are laid in sand are about 1cm and variable in shape and colour (white to pinkish) as they develop. 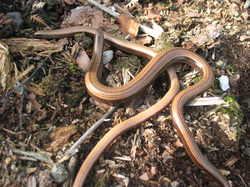 Young are around 4cm after hatching and are light brown with two dorsal stripes. As they develop the young aquire the distinctive ocellate spots on their flanks. 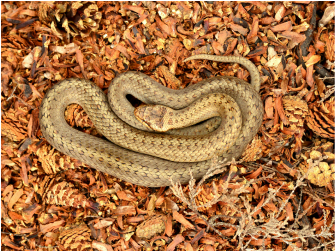 Like the smooth snake (below) they are only found on rare sandy heathland. The only site in Sussex is at Ambersham, Midhurst. The only site in Sussex is at Ambersham near Midhurst. Smooth snakes are our smallest snakes at just 60-70cms long. They are very difficult to find as they seldom venture from the thick vegetation of their preferred habitat. This habitat is sandy heath which is now very rare and hence smooth snakes are also rare. Is not a native of the UK. It was introduced in the nineteenth century and is now quite widespread in Southern England. They are often associated with man-made structures such as thefort on Shoreham beach. 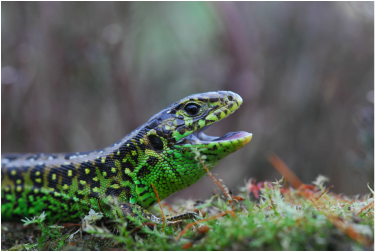 For a brilliant information source on wall lizards click here for the Surrey ARG site on Wall Lizards.